Last week my good friend Park Howell, host of the popular podcast, “The Business of Story” presented an excellent webinar titled, “Your So-called Storytelling is Killing Your Brand.” I have talked for years about the stampede of well intentioned zealots for “the power of storytelling” who appear to have minimal ability to actually tell a story, yet dazzle audiences by presenting the complexity of story analysis drawn from books about story structure. I like to think of it as trying to teach football to little league players using the playbook of the New England Patriots. You can do it, all the parents will brag about how their kid is using such a sophisticated playbook, but is it really going to work if the kids don’t even know how to throw a decent pass or kick the ball properly? This really needs to stop. Please, start with the ABT before you dive into all the exciting complex stuff. It’s what we do in Story Circles Narrative Training. Start with the simple. You need to build INTUITION first. THIS FEEDS STORYPHOBIA. The top diagram shows something called “story spirals.” Why? There’s already enough scientists who are suspicious and dismissive of story dynamics in science without confusing them with excessive complexity. 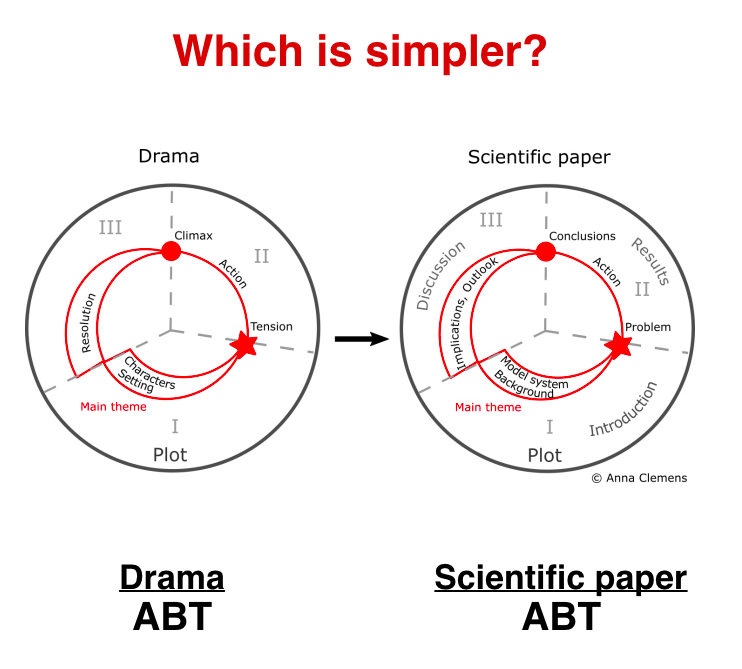 The ABT is the simple pathway to gaining an initial understanding of the narrative underpinnings of science and drama. Start with the simple. Please. I’m sorry to have to single out one person, but a specific example is needed to make this point. I’m sure that Anna Clemens has the best of intentions in writing this essay about telling a story in your scientific paper. But the problem is you really do confuse and lose a lot of people by diving so quickly into the complexity of “plot spirals” (how have I spent 30 years in and around Hollywood and not once heard this term?). Narrative is very, very, very challenging. This is what I learned long ago in film school where I studied with one of the great legends of script structural analysis, Frank Daniel. We know this well in our Story Circles Narrative Training program. As a result, we hold off to the end of each hour session for the discussion and implementation of the full story templates of the Story Cycle (as developed by Park Howell, derived from the work of Joseph Campbell, Jonah Sach’s book, “Winning the Story Wars” and other sources) and the Logline Maker (as developed by Dorie Barton and presented in our book“Connection,” and derived from Blake Snyder’s book, “Save the Cat”). Last week Park Howell presented a great webinar in which he told of how in his workshops he uses the ABT as the simple, intuitive, entry point for eventually crafting a more complex narrative using those templates. Everyone interested in the use of story structure for their communication should listen to his webinar. THE NATIONAL PARK SERVICE IN COLORADO STORY CIRCLES. Last week we posted this short video with three of the participants of the 6 concurrent Story Circles recently concluded by the National Park Service staff in Colorado. Paul Zak (cited in the Clemens article) and his oxytocin storytelling has been discredited by Ed Yong in The Atlantic and ridiculed by John Oliver on his HBO show. Is there really no consequence for having that happen?